The Signal Omni Wavelength was a pretty fun and interesting board because it’s a twin in every aspect except for the 1cm set back stance. This has some pretty big bends between the feet and after but it works very well. We had a lot of fun on this all mountain to all mountain freestyle kind of ride. Conditions: Less than a foot of some light fluffy pow in some places off piste, hard snow and some sprayed around light snow on the groomers. In the past Signal made some pretty crazy shapes that scared the hell out of some that tested them. Signal use to have boards that literally had many centimeters of rocker instead of milometers with very little contact with the snow. Because of these past shapes I (editor) know some people that will never ride a Signal board again. 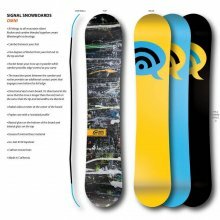 Still we asked for their best all mountain board and they handed us the Omni Wavelength. It is hybrid camber with a pretty pronounced camber and pretty pronounced rocker. We had a pretty good time on this hybrid camber board and like the new shapes. On Snow Feel: Stable between the feet and it had a decent feeling underfoot. 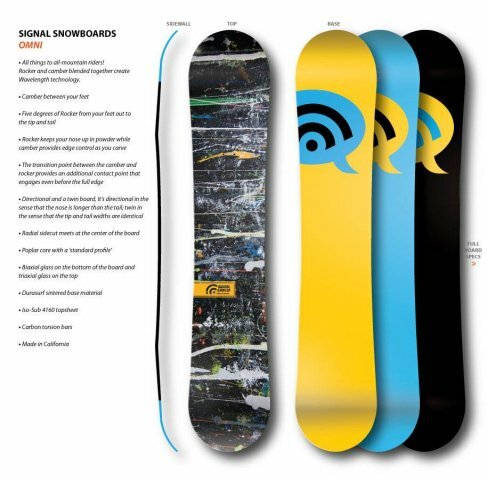 All in all a pretty good board for those who like an all mountain freestyle approach to the mountain. Powder: We had only a little powder but even if you centered the stance with the Omni it would do well in powder for all mountain freestyle riding. The pronounced rocker does more than cancel out the camber between the feet. It provides a pretty effortless float and is very easy to turn in tight spots like trees ect. It felt more like a skate board in the powder than a surf board but many prefer this. Turn Initiation and Carving- Probably on the easy side of moderate. It requires a little work but it feels good to turn. You can lay into a wide radius turn or carve or make tight turns in tight spots. Speed: This has good mountain speed but nothing that will blow minds. We felt it was just a little shy of great and that it can maintain speed well in flat areas. Uneven Terrain: It wasn’t perfect but on the few bumpy spots we encountered weren’t bad. It didn’t pass up too much shock to the body. Approximate Weight- Didn’t feel heavy or light. Edge Hold: We had powder in some places and ice in others so it was a perfect testing day for edge hold. Signal said that they de-tuned the edges and they seemed de-tuned to us too. The Omni rode like it was de-tuned and felt pretty average. We think with the edges being sharp and free of de-tuning the Omni would on the average side of good. Flex: This felt just middle ground of Medium but the W flex makes it pretty easy to butter and press. Switch: With a centered stance the Omni Wavelength performs just like a twin. The only difference is you don’t have as many options to set up your stance as a twin with a centered stance. Jibbing– We usually feel more comfortable with a softer flex but this wasn’t terrible by any means. Pipe: Didn’t feel comfortable in the pipe with the edge hold but if the pipe was softer it could be pretty fun here. Jumps: pretty poppy for ollies and horsing around in natural terrain. If you are going to the roller coaster line you will have a pretty good time here too. Nice and stable on the approach to the kicker. You don’t see many directional twins with a twin flex and set back stance (although minor) which intrigues us. The combo of the hybrid camber, poppy nature along with the flex/shape makes this almost a Good Ride Favorite. If the Edge hold was a little better it would be a very good all mountain freestyle ride for most conditions the average rider faces. We try to get as many images of the Signal Omni, but forgive us if they're not all there. The only things I wish it would have is better edges and maybe a bit stiffer. 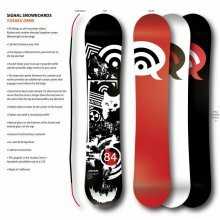 I used to snowboard race and like to go fast. I bought the 2011 model in a 156 w from department of goods. 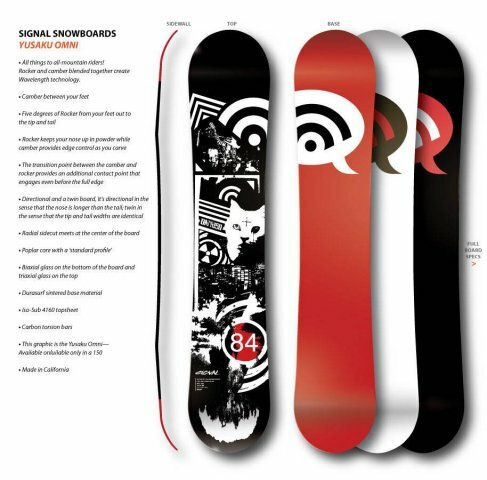 Love the board and the signal brand. Great all road mountain killer.